From the Colors and styles screen, you can change the colors and fonts of elements that appear throughout your site. To display the Colors and styles screen, click Colors and styles under the Website menu. The Colors and styles screen lists the elements you can change along the left, and displays a preview of your changes on the right. Within the preview, you can click menu items and links to jump from page to page. Your changes won’t be applied to the actual site until you click on Save. Settings for different elements are grouped into categories. The categories vary depending on the website theme you have chosen. To expand the categories and view the elements within, click the plus sign beside the category name. For each element you can define a number of characteristics. If you select the Automatic option, the setting will be controlled by your website theme. Some elements on your site can be controlled by more than one setting. For example, a heading formatted using the H4 style that's also a link can be controlled using either the General formatting > H4 setting or the General formatting > Link setting. Some elements are general settings than be overridden or superseded by more specific elements. 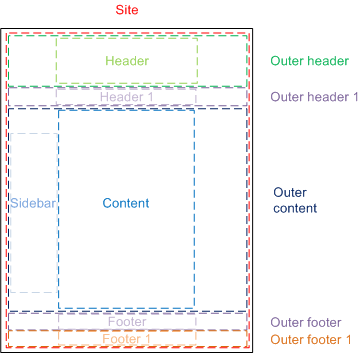 For example, the Site background setting under General formatting > Backgrounds can be overridden at the top of the page by one of the header settings, or in the middle of the page using one of the content settings. The settings appearing on the Color and Styles screen, and their order and default values, can be customized for a particular theme using theme overrides. For more information, see Customizing Colors and Styles options for themes. You can modify the following elements for Blueprint themes. General formatting settings apply throughout your website but can be superseded by more specific settings. For example, your General formatting > Link settings can be overridden for breadcrumbs by your Login box > Links settings. For each of the elements below, you can control the following background attributes. The background color of the element. You can select a color from the drop-down palette or enter the hexadecimal code for the color (e.g. #FF0000 for red). An image to be displayed as the background the element. You can select an image by clicking the ellipsis button ( ... ), or remove an image by clicking the X button. Using the Background repeat setting (below), you can control whether and how the image is repeated. Controls whether the background is repeated horizontally or vertically, or both (tiled) or not at all. The overall background of your site. The background set here can be partially overridden by more localized background settings below. The top portion of the header area at the top. The background set here can be partially overridden for the center portion of the top header by the Header setting below. The background of the center portion of the outer header. The bottom portion of the header area. The background set here can be partially overridden for the center portion of the area by the Header 1 setting below. The background of the center portion of bottom header area. This is a sticky placeholder that creates a non-scrolling area, suitable for sticky menus. The background of the sidebar to the left of the Content area. The background of the rightmost portion of the sidebar. The background of the main content area of the page. The background set here can be partially overridden for the center portion of the area by the Content setting below, and for the leftmost portion using the Outer sidebar and Sidebar settings above. The background of the center portion of the main content area. The background of the top footer. The background set here can be partially overridden for the center portion of the top footer by the Footer 1 setting below. The background of the center portion of the top footer. The background of the second footer area. The background set here can be partially overridden for the center portion of the top footer by the Footer 1 setting below. The background of the center portion of the second footer. Controls the appearance of text formatted using text styles. Appearance of text formatted using the Normal text style. Most – but not all – body text and text labels throughout your site are formatted using the Normal style. For linked text, the Link setting (below) will override the Normal setting. Appearance of text formatted using the Wide text style. Appearance of text formatted using the Narrow text style. Appearance of text links. The Link setting will supersede the Normal setting above for text links. Appearance of the text links when a mouse pointer hovers over them. Appearance of text formatted using the Promo text style. Appearance of text formatted using the Page title text style. Appearance of headings formatted using the H1 style. Appearance of headings formatted using the H2 style. Appearance of headings formatted using the H5 style. Appearance of text formatted using the Quoted text style. Appearance of text formatted using the Alternative text style. Appearance of field labels on forms such as event registration, email subscription, and membership application. If you do not specify settings here, the General formatting > Text settings (above) will be applied to form labels. Appearance of text labels for radio buttons or check boxes, as well as level names and descriptions on membership application forms. Appearance of headings on member details and member profile screens. Appearance of field instructions added to form fields, as well as level descriptions on membership application forms. Controls the appearance of tables used to display database information in gadgets such as the member directory gadget. These settings do not control the appearance of tables you insert into content pages. Appearance of the column headings at the top of the table. Background color of a row when a mouse pointer hovers over it. Font color of text links within the table. Font color of text links within the table when a mouse pointer hovers over them. Controls the appearance of the areas used to list information within gadgets. Font color of text links within the info box. Font color of text links within the info box when a mouse pointer hovers over them. Appearance of headings at the top of each info box. Font color of text links with the info box heading when a mouse pointer hovers over them. Background color of boxes appearing on certain gadgets (e.g. blog gadgets). Appearance of the header area at the top of the box. Appearance of links within the header area at the top of the box. Appearance of links within the header area at the top of the box when a mouse pointer hovers over them. Appearance of labels within the box. Appearance of text within the box. Appearance of links within the box. Appearance of links within the box when a mouse pointer hovers over them. Background color of the area at the bottom of the box. 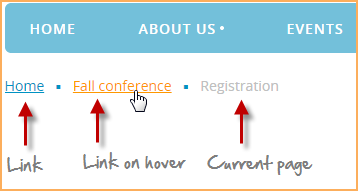 Appearance of links within the footer area. Appearance of links within the footer area when a mouse pointer hovers over them. Controls the appearance of text within lists such as the list of forum topics. Appearance of text within the list. Appearance of links within the list. Appearance of links within the list when a mouse pointer hovers over them. Background color of rows within the list. Background color of highlighted row within the list. The appearance of the gadget title. You can specify text attributes for the title text, and a background color or image for the title bar. You can select a color from the drop-down palette or enter the hexadecimal code for the color. If you specify a background image – by clicking the ellipsis button ( ... ) – you can use the Background repeat setting to control whether and how the image is repeated. The appearance of the gadget body. You can specify text attributes for the body text, and a background color or image for the body area. You can select a color from the drop-down palette or enter the hexadecimal code for the color. If you specify a background image – by clicking the ellipsis button ( ... ) – you can use the Background repeat setting to control whether and how the image is repeated. Appearance of text links. The Link setting will supersede the Text setting above for text links. The fill color of the donation progress bar. You can select a color from the drop-down palette or enter the hexadecimal code for the color. The background color of the donation progress bar. You can select a color from the drop-down palette or enter the hexadecimal code for the color. Controls the appearance of the date and time labels within forum update gadgets and recent blog posts gadgets. Controls the appearance of the location label within upcoming events gadgets. Controls the appearance of the author label within forum update gadgets and recent blog posts gadgets. The appearance of the link button. You can specify text attributes for the button label, and a background color for the button. You can select a color from the drop-down palette or enter the hexadecimal code for the color. The appearance of the link button when a mouse pointer hovers over it. You can specify text attributes for the button label, and a background color for the button. You can select a color from the drop-down palette or enter the hexadecimal code for the color. Font family and size of top-level menu items. These are the elements that appear within a log in form gadget. Appearance of the login fields used to enter the username and password. 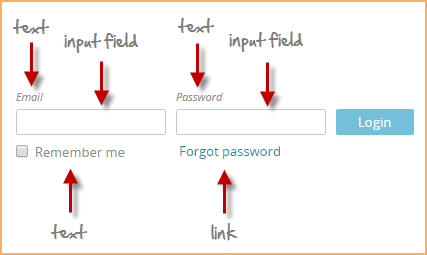 Appearance of the text labels that accompany the login fields. If you do not specify settings here, the General formatting > Typography > Text settings (above) will be applied to the login box text labels. Appearance of the text links that accompany the login fields. If you do not specify settings here, the General formatting > Links settings (above) will be applied to login box links. Appearance of the login links when a mouse pointer hovers over them. If you do not specify settings here, the General formatting > Links on hover settings (above) will be applied to login box links. These are the elements that appear within the breadcrumbs gadget. Appearance of the breadcrumbs that show your current location within a set of subpages. If you do not specify settings here, the General formatting > Typography> Text settings (above) will be applied to the breadcrumbs. Color of the links within the breadcrumbs. If you do not specify settings here, the General formatting > Links settings (above) will be applied to the breadcrumb links. Color of the breadcrumb links when a mouse pointer hovers over them. If you do not specify settings here, the General formatting > Links on hover settings (above) will be applied to the breadcrumb links. Color of the current page within the breadcrumbs. Controls the appearance of text links within navigation links gadgets. Font color of text links within navigation links. Font color of navigation links when a mouse pointer hovers over them.